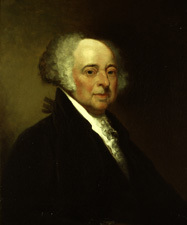 ADAMS, John, (father of John Quincy Adams; grandfather of Charles Francis Adams; cousin of Samuel Adams; father–in–law of William Stephens Smith), a Delegate from Massachusetts and a Vice President and 2d President of the United States; born in Braintree, Mass., October 19, 1735; graduated from Harvard College in 1755; studied law; admitted to the bar in 1758 and commenced practice in Suffolk County; joined the Sons of Liberty and argued against the Stamp Act; was elected to represent Boston in the general court in 1768; Member of the Continental Congress 1774-1777; signed the Declaration of Independence and proposed George Washington, of Virginia, for General of the American Army; became a member of the Board of War, but resigned to accept appointment as commissioner to the Court of France; Minister Plenipotentiary to Holland 1782; first Minister to England 1785-1788; elected in 1788 as the first Vice President of the United States with George Washington as President; reelected in 1792 and served from April 21, 1789, to March 3, 1797; elected President of the United States and served from March 4, 1797, to March 3, 1801; delegate to the constitutional convention of Massachusetts 1820; died in Quincy, Mass., July 4, 1826; interment under the old First Congregational Church, now called the United First Parish Church. Papers: 1807, 10 letters. Letters sent by John Adams to Mercy Otis Warren, July-August, 1807. In the letters, John Adams discusses the portrayal of him in Mercy Warren's published work titled History of the Rise, Progress, and Termination of the American Revolution (1805). John Adams details factual errors and responds to comments on his character in the letters. Papers: 1762-1763, 1 folder. Four fragments from the law journal of John Adams, kept from 1762-1763. Entries list John Adams's cases and fees charged for his services. Papers: 1820, 1 item. A letter from John Adams to Mathew Carey thanking Carey for his gift of a copy of Vindiciae Hibernicae. John Adams states that his poor health prevents his participation in national affairs. Papers: 1779-1807, 3 items. Includes letters from John Adams to Elbridge Gerry, 1779; Captain Richard O'Brien, 1786; and Dr. Benjamin Rush, 1807. Papers: 1767, 1 item. A letter from John Adams to Major Miller explaining a point of law regarding taxes paid by a plaintiff for travel to court. Papers: 1783, 1 item. A document signed by John Adams, Benjamin Franklin, and John Jay. Papers: 1801, 1 item. A letter from John Adams, dated March 2, 1801, to Samuel Dexter, Esq., the Secretary of the Treasury. In the letter, John Adams requests that an order on General Lincoln, Collector of Boston, for the balance due him. Papers: 1798, 1 item. A Presidential authorization, dated March 30, 1799, allowing a ship (Amazon) to pass through. On the reverse is a statement signed by Joseph Pitcairn, Consul of the United States at Hamburgh, certifying that the ship is mounted with 14 guns. Papers: 1818, 0.5 linear foot. Includes letters written by John Adams to William Tudor on the subject of American Independence. Papers: 1807, 1 page. A receipt dated September 28, 1807, for dividends on fire and marine insurance company shares. Papers: ca. 1778-1820, approximately 35 pages. Correspondents include Mercy Otis Warren, Mr. Dumas, Benjamin Rush, William Jones, J.H. Tiffany, Edme Jacques Genet, Dr. Williams, Benjamin Stoddert, Benjamin Waterhouse, Jonathan Mason, Winthrop Sargent, William Plumer, and his son, T.B. Adams. Some of the correspondence deals with the war with England. Papers: 1778-1817, 6 items. Letters and autographs represented in various collections. One autographs is in The signers of the Declaration of Independence, 1824, volume 8. Two autographs are in Jared Sparks's Autographs of Washington, Franklin, and Lafayette, in the section of Franklin autographs, on the AMS, Franklin's Instructions to W. T. Franklin, dated November 20, 1778, and on the Franklin's Private Instructions to W. T. Franklin, [late 1798]. In both cases, John Adams's signature is under that of Benjamin Franklin. Other correspondents include Miss Lomax, John Trumbull, and General Lafayette. Papers: 1798, 1 page. A letter "To the Officers of the Militia and the other Freeholders and Inhabitants of the town of Duanesburgh in the County of Albany and the State of New York" responding to a letter from the townspeople concerning events of the time. Papers: ca. 1771-1812, approximately 53 pages. Correspondents include Benjamin Rush, Philip Mazzei, Thomas Cushing, James McHenry, Calvin Perkins, and Thomas Adams. Other letters are to John Adams's wife, Abigail. Also included are two notebooks listing court cases. Papers: 1821, 1 item. A letter from John Adams, forwarding a letter from Benjamin Waterhouse to James Monroe. In John Adams's letter, he mentions Benjamin Waterhouse's present difficulties being a result of his outspoken support of "the Union." Papers: 1781, 1 item. A letter from John Adams addressed to "Sir." Papers: 1779, 2 pages. A letter from John Adams sent concurrently with vouchers for his expenses in France. Papers: 1813, 1 item. A letter from John Adams to Mathew Carey, concerning six papers given him by John Marston regarding Revolutionary War officers and their worth. Microfilm: In the Adams Family Papers, 1639-1889, 608 microfilm reels. Persons represented include John Adams. Originals are held by the Massachusetts Historical Society. Papers: In the Adams Family Papers, 1776-1914, 230 items. Correspondents include John Adams. A finding aid is available in the library. Microfilm: In the John Adams-Thomas Jefferson Correspondence, 1776-1826, 1 reel. Correspondents include John Adams. Originals are held by the Massachusetts Historical Society. Microfilm via Princeton University Library. Papers: ca. 1776-1814, approximately 10 items. Correspondents include Mr. Lee, Richard Rush, Francis Dana, James McHenry, General Joseph Palmer, Thomas Jefferson, Dr. Tufts, and Benjamin Rush. Topics covered include events in Europe and New England. Papers: 1800, 1 item. A letter from John Adams to John Jay. The letter was written upon the resignation of Oliver Ellsworth from the office of Chief Justice of the Supreme Court. President John Adams sent this letter to John Jay advising him of his renomination to that office. At the time, John Jay was serving his second term as Governor of New York. Papers: ca. 1776-1813, approximately 11 items. The bulk of this correspondence is between John Adams and John Trumbull. Other correspondents include Elkanah Watson, John Wendell, and Samuel Elliot. Also included is a letter from John Adams to his four year old son, Thomas. Papers: 1801, 1 item. A letter from John Adams to Christopher Gadsden, April 16, 1801. Papers: 1807, 3 pages. A letter from John Adams to Mercy Otis Warren. Papers: In the Lockwood Collection, 1800, 1 item. A letter from John Adams to P. Legaue, housed in a volume labeled "wine." Papers: 1821, 2 pages. A speech dated August 1821 delivered to the Corps of Cadets at the United States Military Academy on August 14, 1821, following the march of the Corps from Boston to John Adams's in Quincy, Massachusetts. Papers: 1797, 3 pages. A letter from John Adams to Hon. Samuel Griffin, Esq., dated January 19, 1797. In the letter, John Adams thanks Samuel Griffin for his offer of congratulations and suggestions regarding hiring a private secretary. Also mentioned is French policy toward the United States. Papers: 1780 and 1798; 2 items. One letter from John Adams to Mr. Grand, dated February 29, 1780, relates to money appropriated by Congress to John Adams and Francis Dana. Another letter from John Adams to an unknown man, dated July 18, 1798, mentiones that John Adams has received and signed the commissions he had been sent. Papers: 1809, 1 item. A letter from John Adams to Rev. William Bentley dated October 26, 1809. In the letter, John Adams mentions some historical materials brought by Rev. Bentley that John Adams felt should be in the Historical Society. Papers: 1813-1814, 2 items. Includes two letters from John Adams to Benjamin Rush and to Mercy Otis Warren. The letter from John Adams to Benjamin Rush, dated February 3, 1813, discusses the selection of William Jones as Secretary of the Navy and notes that many Federal offices are held by men from Pennsylvania. The letter to Mercy Otis Warren, dated February 2, 1814, forwards Thomas McKean's account of the signing of the Declaration of Independence. Adams, Charles Francis. The Life of John Adams. Philadelphia: J.B. Lippincott & Co., 1871. Adams, John. The Adams Papers. Edited by Richard Ryerson, L.H. Butterfield, Marc Friedlander, et al. Cambridge, Mass. : Harvard University Press, 1961. ___. Diary and Autobiography. 4 vols. Edited by Lyman H. Butterfield. Cambridge, Mass. : Harvard University Press, 1961. ___.. Familiar Letters of John Adams and His Wife Abigail Adams, During the Revolution. Edited by Charles F. Adams. Boston: Houghton Mifflin, 1875. ___. John Adams Papers. Edited by Frank Donovan. New York: Dodd, Mead, 1965. ___. Legal Papers of John Adams. 3 vols. Edited by L. Kinvin Wroth and Hiller B. Zobel. Cambridge, Mass. : Harvard University Press, 1965. ___. Letters from a Distinguished American: Twelve Essays by John Adams on American Foreign Policy, 1780. Compiled and edited by James H. Hutson. Washington: U.S. Government Printing Office, 1978. ___. Statesman and Friend: Correspondence of John Adams with Benjamin Waterhouse, 1784-1822. Edited by Worthington Chauncey Ford. Boston: Little Brown and Company, 1927. ___. The Works of John Adams, Second President of the United States. 10 vols. Boston: Little, Brown, 1850-1856. ___, Abigail Adams, and Thomas Jefferson. The Adams-Jefferson Letters: The Complete Correspondence between Thomas Jefferson and Abigail and John Adams. 2 vols. Edited by Lester J. Cappon. Chapel Hill: University of North Carolina Press, 1959. ___, and Benjamin Rush. The Spur of Fame: Dialogues of John Adams and Benjamin Rush, 1805-1813. Edited by John A Schutz and Douglas Adair. San Marino, Calif.: Huntington Library, 1966. Bailyn, Bernard. "Butterfield's Adams." William and Mary Quarterly 19 (April 1962): 238-256. Bowen, Catherine D. John Adams and the American Revolution. Boston: Little, Brown, 1950. Brown, Ralph A. The Presidency of John Adams. Lawrence: University Press of Kansas, 1975. Chamberlain, Mellen. John Adams, the Statesman of the American Revolution: With Other Essays and Addresses, Historical and Literary. Boston: Houghton Mifflin, 1898. Cohen, I. Bernard. Science and the Founding Fathers: Science in the Political Thought of Jefferson, Franklin, Adams and Madison. New York: W.W. Norton, 1995. Cranch, William. Memoir of the Life, Character, and Writings of John Adams; Read, March 16, 1827, in the Capitol, in the City of Washington, at the Request of The Columbian Institute, and Published by their Order. Washington: S.A. Elliot, Printer, 1827. Diggins, John P. John Adams. New York: Times Books, 2003. Ellis, Joseph J. Passionate Sage: The Character and Legacy of John Adams. New York: Norton, 1993. ___. John Adams: A Life. 1992. Reprint, New York: Henry Holt & Co., 1996. ___. "An Office of Unprofitable Dignity." American History Illustrated 24 (March 1989): 12-23, 52. Guerrero, Linda. "John Adams' Vice Presidency, 1789-1797." Ph.D. dissertation, University of California, Santa Barbara, 1978. Handler, Edward. America and Europe in the Political Thought of John Adams. Cambridge, Mass. : Harvard University Press, 1964. Haraszti, Zoltan. John Adams and the Prophets of Progress. Cambridge, Mass. : Harvard University Press, 1952. Howe, John R. The Changing Political Thought of John Adams. Princeton, N.J.: Princeton University Press, 1966. Kunstler, William M. "John Adams." In his The Case for Courage, 46-81. New York: William Morrow, 1962. Kurtz, Stephen G. "Political Science of John Adams." William and Mary Quarterly 25 (October 1968): 605-613. Miroff, Bruce. "John Adams: Merit, Fame, and Political Leadership." In his Icons of Democracy: American Leaders as Heroes, Aristocrats, Dissenters, and Democrats. New York: Basic Books, 1993. Morse, John T. John Adams. Boston: Houghton Mifflin, 1884. Myers, J. Jay. "John Adams: Atlas of Independence." In his The Revolutionists, 26-46. New York: Washington Square Press, 1971. Padover, Saul K. "The American as Aristocrat: John Adams." In his The Genius of America: John Adams." In his The Genius of America: Men Whose Ideas Shaped Our Civilization, 43-54. New York: McGraw-Hill, 1960. Ryerson, Richard A. "John Adams' First Diplomatic Mission: Philadelphia 1774." Massachusetts Historical Society Proceedings 95 (1983): 17-28. Ryerson, Richard Alan, ed. John Adams and the Founding of the Republic. Boston: Massachusetts Historical Society (Northeastern University Press), 2001. Shepherd, Jack. The Adams Chronicles: Four Generations of Greatness. Boston: Little, Brown, 1975. Smith, Page. John Adams. 1962. Reprint, Collector's edition. Norwalk, Conn.: Easton Press, 1988. Thompson, C. Bradley. John Adams and the Spirit of Liberty. Lawrence, Kans. : University Press of Kansas, 1998. Umbreit, Kenneth B. "John Adams." In his Founding Fathers: Men Who Shaped Our Tradition, 104-161. Port Washington, N.Y.: Kennikat, 1969. Wildman, Edwin. "John Adams: Who Devoted His Life to His Country." In his The Founders of America in the Days of the Revolution, 194-214. Freeport, N.Y.: Books for Libraries, 1968. Young, Donald. "John Adams-Thomas Jefferson-Aaron Burr." In hisAmerican Roulette: The History and Dilemma of the Vice Presidency, 5-23. New York: Holt, Rindhart and Winston, 1965.